In our previous post, explains you the login system using PHP with PDO connection. Here is an extra feature that can be added to login system for an extra layer of security. 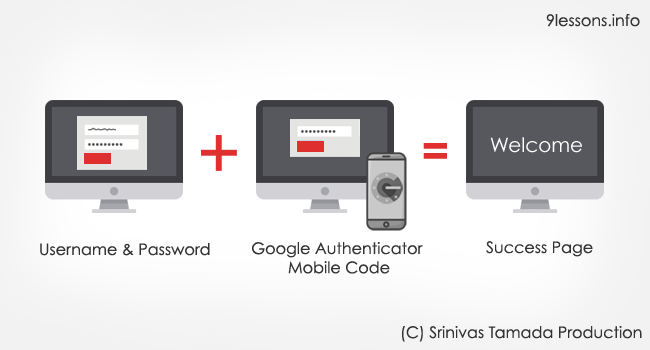 It is 2 factor authentication using Google Authenticator App for Android/iPhone. Your account could be at risk of having your password stolen. 2 step verification can protect from misuse of your account if someone have your password, because logging into your account always require a security code(this verification code is uniquely designed for your account, if you opt for verification code, an unique code is sent to your mobile for every 30-60 seconds) in the second step after you enter your password. With 2 step verification, we can protect our account with both password and mobile. Add this 2 factor authentication to make your account more stronger. Download and install Google Authenticator application on your mobile device, use the following icons. You need this for 2 step user authentication, please watch the following demo video. User table contains all the users registration details, here you have to store user details with unique Google authentication code. Enable PDO extension for PHP, find this in php.ini configuration file. The tutorial contains two folders called googleLib and class with PHP files. device_confimation.php // Device confirmation page. Database connection configuration file, here you have to modify username, password and database details. If you are using other database modify PDO() driver connection value. This post will help you design HTML login and registration forms PHP Login System with PDO Connection. This class contains there methods userLogin, userRegistion and userDetails. Contains PHP and HTML code, works base on user form submit.. Enter the verification code generated by Google Authenticator app on your phone. User welcome page, display user details base on user session value. his will validate and store the user session value. This code will clear the user and Google aunthentication session values. Try again, it is working for me. thanks for great tuturial.I have a question; how we can use this login and signup form with this method for wordpress site? There is a Google Authenticator plugin for Wordpress. How to using password of google account to login? working fine for Signup page But not on login page for me any help please? Anyone can authenticate using his phone ? Is it related to user email id ? I have done signup in demo. And try scan with same device which i used while signup then login was successful. But I used another device to scan QR code then also login successful. So, how it is secure? If hacker steal my password and try his/her device to scan QR code, then hacker can be able to login. A late response, but i just found the script. I agree on this. The QR code should only be visable on registration so it will be added to your account. On that point your mobile device can generate the 2FA code and you dont need the QR code anymore. when i scan bar code i get the code and when i entered that code after that nothing happens. i downloaded the code and when i scan the bar code i get the security key after entering that security key nothing happens ....? It's a good tutorials. I have one question. Can we have a list of 8 digit recovery codes as google gives? I try your code on my website and it is working fine but did you see one mistake in your code. When you login and enter google code then you go on home.php page right. Now you try this: Do not logout your home.php and open again index.php on different tab here its goes directly device_confirmations.php page it is good. When you enter any random text or number in textbox or without enter anything in the textbox its directly go to home.php that's not good. index.php should not be openable after login session generated, this is just opposite logic we use to not let people open after login page. it's not working for me.. Code and calculatedCode didn't matched in verifyCode function..Any help? Dear Admin Please remove comma(,) in lat line of user.sql when download. How to recover this hash password? just create database set username,password in config.php also set BASE_URL in config.php and test. Thanks man you made my day. Thanks. It's working well in mylocalhost, but on servers it doesn't. I think have to do something for time setup. can you assist me?